If you didn't read yesterday's post...I'm still looking for some good book recommendations! Now, on to today. Little man decided to start talking at 4:49am, then again at 5:45am, at which point I figured my day would be starting. Low and behold, he finally fell back asleep until 7:15am! I guess all he really wanted was a pacificer and his stuffed monkey to cuddle with:) If only that would work on adults. I'm sharing a simple side dish with you today...what am I kidding, it's not really even a side dish, but it does nicely accompany any pasta dish. Pre-warning, it's NOT healthy, but one slice can't hurt you. I originally got this recipe from my sister-in-law, but had to adapt it a little the other day to what I had on hand. Pre-cut the french bread (if using a loaf) or simply use regular bread or buns. Combine all ingredients and slather on bread. Place on baking sheet or foil and place in the oven on broil. Keep you eye on the oven, this can burn easily! Remove from oven once mixture is bubbling and bread has turned golden brown. 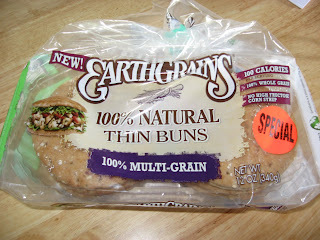 Sorry, for the lack of good pictures, but trust me this bread is really good. I did have the husband venture out for a good french loaf at the store but they were all out. The tragedy. Why is a pasta dish always better with a side of crusty garlic bread? It IS always so much better with cheesey bread. Mmmm. I'm reading "The Nanny Returns" by Emma McLaughlin and Nicola Kraus...very entertaining! This looks really good, I'll have to try this. I try to stay away from the bread but the family likes it. Ah, who am I kidding, I love it too! They sound really good, love that garlic! I just finished reading "The Help" by Kathryn Stockett. It's filled with great, interesting characters during a difficult time and is an amazing read while being humorous at times!!! My favorite author is Adriana Trigiani - she has really great books. I recommend all of them! That's all I can think of right now. I haven't read in a few months, sadly b/c of school. I keep meaning to check some things out from the library and then realize I won't have time for them, so forget it. Ha - I had to laugh at Beth's @D&D's comment! Pioneer Woman had a similar recipe with mayo and at first I was like "gross!" but it was heaven. And hers wasn't healthy either - but who cares! Thanks for the great recipe! I love garlic bread!!! Mmmm...garlic bread is SO tasty and useful when it comes to sopping up all the leftover sauce! 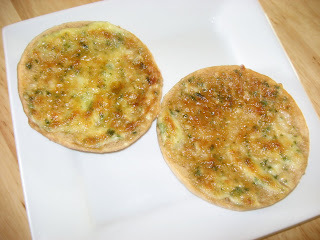 I've actually never thought of making garlic bread out of the sandwich thins! I love those and I agree, you can't have pasta without it! Sorry your baby got up so early, it makes for a LONG day for you! Oh, wow! 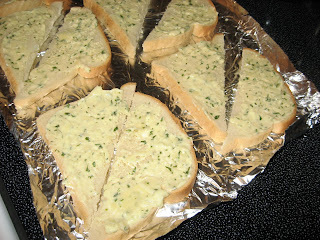 I love garlic bread...I'm going to have to try this soon! YUM! Read the sequel to Bread Alone :) It's just as good!!! I've also wanted to read Cooking For Mr. Latte by Amanda Hesser. It just hasn't come in the library yet!